One of the recent weekends was full of wonderful moments of happenstance. 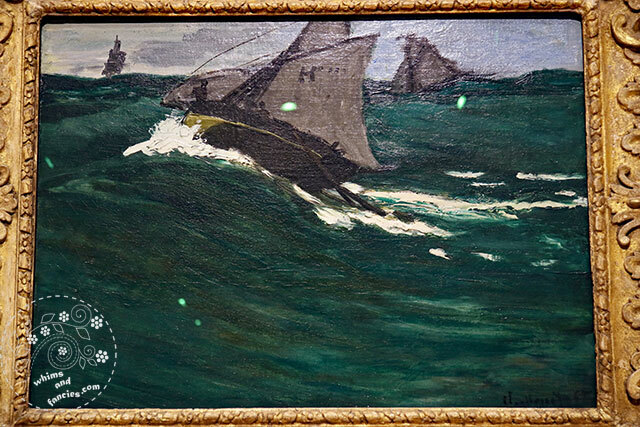 The weekend started with visiting an exhibition called Monet: The Early Years at one of the museums in San Francisco. Earlier in the month, I had mentioned it to my husband. Knowing how much I adore the Impressionist painters, he got us tickets for the event. A couple of weeks ago we were there on Saturday morning, bright and early, although not quite bright-eyed and bushy-tailed. We explored his early work through approximately sixty paintings. Exquisite play of colours, light and shadow, brush strokes and dynamics are an integral part of every painting. Although he lived in abject poverty, Monet was so passionate about this work that he continued on with his personal style of painting. The museum also has two small paintings by Van Gogh. As I walked into the Gallery that had the Van Gogh pieces on display, there was this painting by Monet right across from where I was standing. As we walked around the room, we found a few more paintings by Monet and Renoir. A lovely surprise find before leaving the museum. My violin bow had been at the luthier to be rehaired. They are about an hour away from our house, and also an hour away from San Francisco. The bow was ready so we decided to stop by to pick it up on our way back. We found a small coffee shop where we recharged before heading home via a beautiful road. 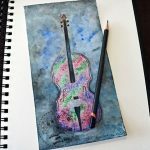 Inspired by the all the artwork of the morning and atmosphere of the violin shop, I have a new musical pattern brewing. On the way back, the conversation digressed toward the gardens of Versailles. We haven’t been to France yet, but we have seen a couple of beautiful stately home gardens in England. It was therefore not hard to imagine the scale and beauty of the gardens of Versailles. Our home is not a very large one, but I do like to take inspiration from large enterprises and scale them down to suit my need. The thought of doing the same with our garden stayed with me. Next day, when my husband went to the shop, I went along to browse the plants area. I wasn’t planning on buying anything, but then I spotted this white rose. All resolve melted away and I came home with 29 plants! 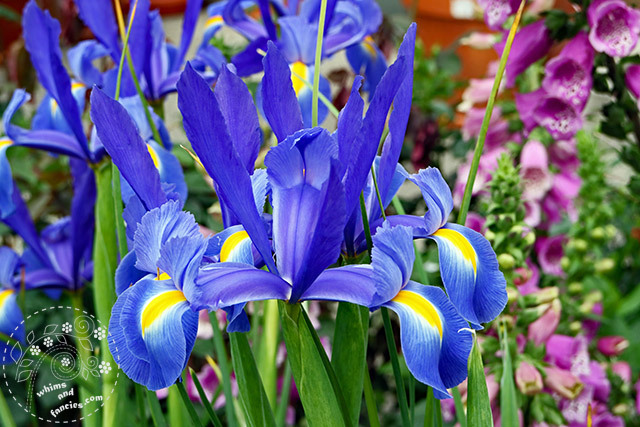 Can’t say no to irises. I got these and my friend Mary sent me some more. I am a lucky girl. The following Friday, after work, I sat down with the garden measurements to create a layout for the plants. 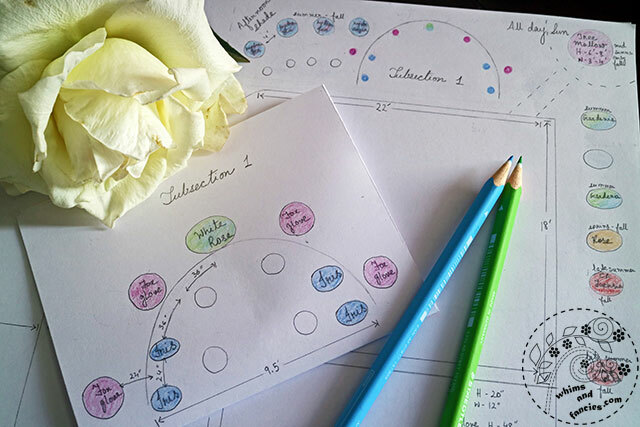 Influenced by the larger gardens of the stately homes, I am designing a garden with a few different focal points. Our garden may not be huge, but it is certainly big enough for that. I created a circular focal point with the white rose in the centre. It is a working plan, so it will continue to grow as I get inspired by the greatness of others. I am going to take a break for the next couple of weeks. Hopefully a few more moments of happenstance will find me. 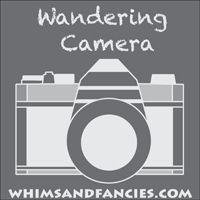 I am also linking up on Through My Lens, Our World Tuesday, Wednesday Around The World, Seasons, and Friday Photo Journal along with other linky parties on my Events And Links page. I just love all of it, the white Rose is a fav. The paintings are beautiful, Monet has always been one of my favorites. 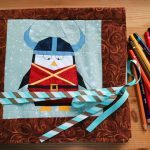 Your violin paper pieced pattern is awesome! Wonderful post. Very nice beautiful photos. Sounds like a beautiful day. All the art and flowers are wonderful! 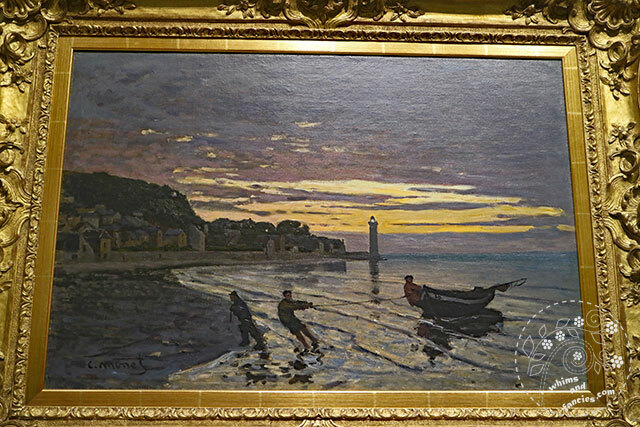 What a joy to see those early paintings of Monet in person! I love the colorful water lillies. If you go to France, you will want to include a visit to Giverny, as Monet’s gardens are just as he painted them in his later years. So lovely. Have fun planning and planting your spring garden! Such a musical piece! very precise……………..
Wow – what a fabulous weekend. Very envious about seeing that Monet exhibition. Have you seen the movie, A Little Chaos about the building of the gardens at Versailles. Sumptuous costumes and setting. What is the name of the rose you bought? I adore Monet! Would love to see the exhibit. Your flowers are lovely as well. What a nice post! I’ve always adored his use of color. Looks like it was a beautiful exhibit. Gorgeous flowers. The nice thing about all the rain this year is that the flowers are all so beautiful this year. The irises, foxgloves, and roses are exuding such beauty, and you took perfect shots of them! 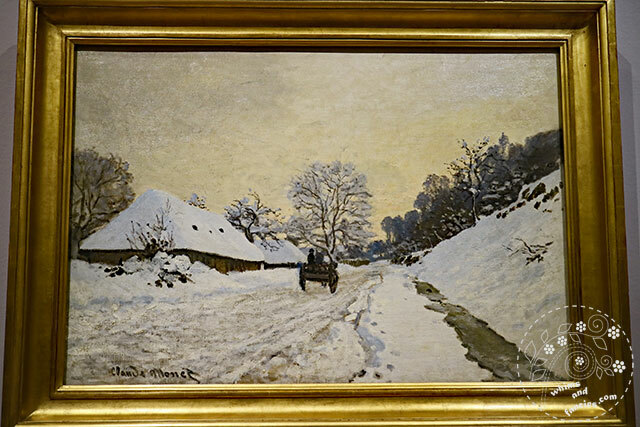 The snowy road is my favorite of the ones you showed from Claude Monet:) Do you know there was also a painter with the last name Manet? 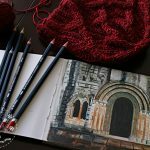 Only one letter difference, also painting in impressionistic style:) ) Lovely post Soma, and with so many beautiful things you shared in this post with All Seasons! Wishing you a beautiful week! First time here and plan to follow you! Love Monet! have been to his gardens in France as well as Versailles, definitely worth the trip!! White roses are my favourite next to bright gerberas!!! When we had a garden I aspired to an all-white section. 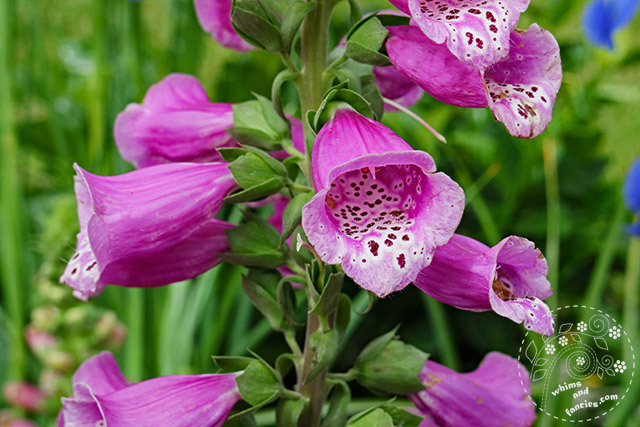 Your garden plans sound very promising and I love your purchases (though I can’t imagine having to buy foxgloves – I have them like weeds here, have to thin them out every year). 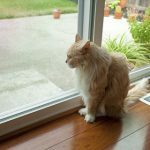 Enjoy your blogging break. So luscious Monet and your blocks and photos .Hope you have a lot of fun in your break times.!! I think I have seen your second capture of Monet before. 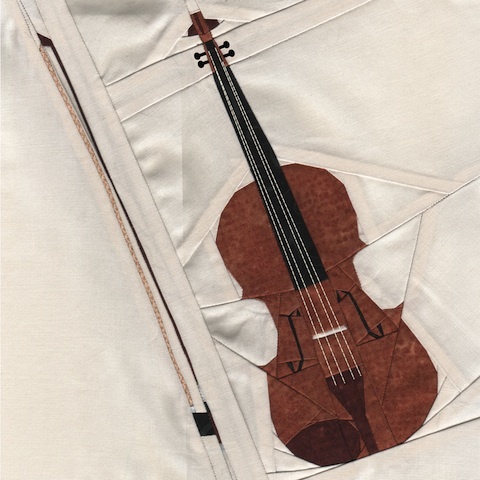 Your quilt piece of the violin is so beautiful!! – I love it:) The lovely foxgloves – pleasant memories of the house in the forest in Holland we rented. They came to my height.! Good luck with your gardening! I wish I had a green thumb, but plants run when they see me in the garden area. It sounds like your garden will be very lovely. 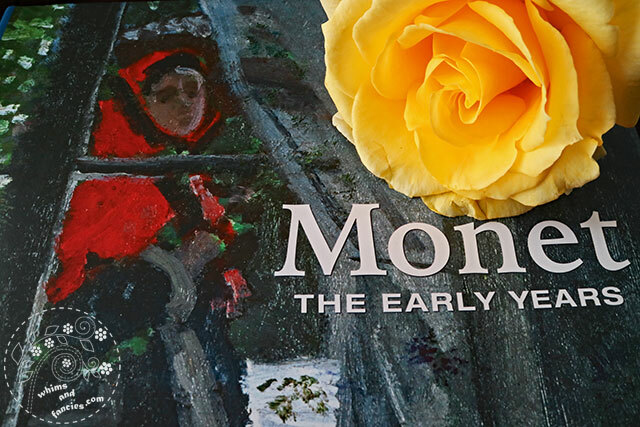 Lovely photos of Monet and flowers. Your violin patter is so detailed. Interesting! Do I suppose a trip by you to France sometime in the future. I can only but dream of wandering through the garden of Versailles and then Monet’s Garden at Giverny. Wouldn’t that be a dream come true. So excited by the beautiful plants you bought. Your garden is going to be wonderful. I look forward to seeing it grow through the lens of your magical camera. A stunning violin pattern, Soma. What an amazing weekend filled with delightful happenstance. Thank you for sharing the joy of it. Monet would have to be one of my favourite artists I wish I could have visited the museum too! I would have been so inspiring to see. Did it inspire you with your gardening. I’ve been looking for a fiddle pattern for a year now. I think your violin would work. I’ve been to Paris and the Rodin Gardin and the Louvre and The Orangerie (Monet museum. They are all wonderful. Monet is my favorite painter and I can look at his paintings for hours and I did! That exhibition must have been amazing! I’m so glad that you were able to see it. Your garden is going to be stunning. The iris and foxglove look so pretty and will be such a great addition to the white rose. I can’t wait to see your next musical piece. I think that your first pieces were what made me start following you. Right? The precision is breathtaking. You do them so beautifully – a labor of love. Your flowers are beautiful, and that violin block is just magnificent! I can’t believe you managed to paper piece with that level of detail, right down to the F holes! A museum full of inspiration…it’s no wonder you couldn’t resist the flowers and brought home so many. :) I’m sure your garden will be beautiful. I’m not much of a gardener, but I do love the few plants I manage to keep alive. 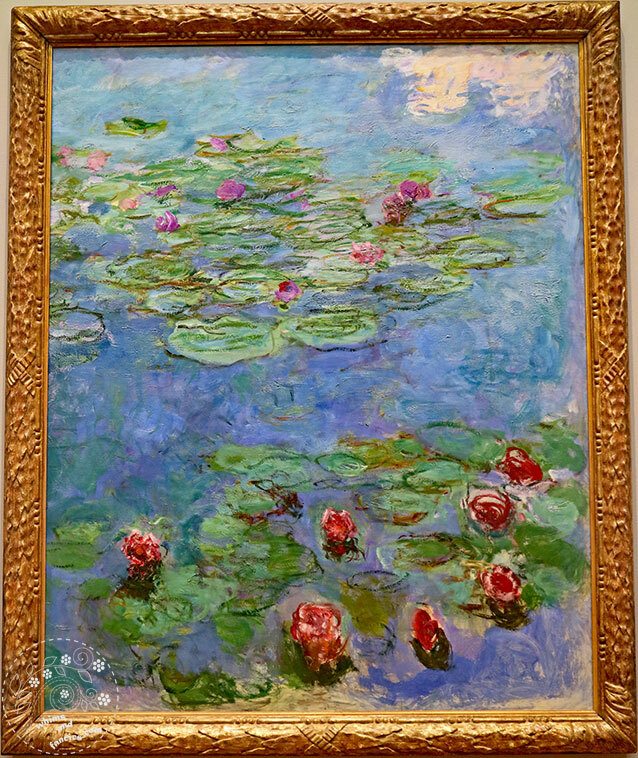 I was out in San Francisco this spring and the Monet show there one day after I left!!!! I’m jealous. The Monet exhibit must have been marvellous to see. We were fortunate to visit his garden outside of Paris a couple of years ago, absolutely stunning! I highly recommend a visit! What an adventure. Monet’ art is so fabulous. Thank you for sharing your visit. 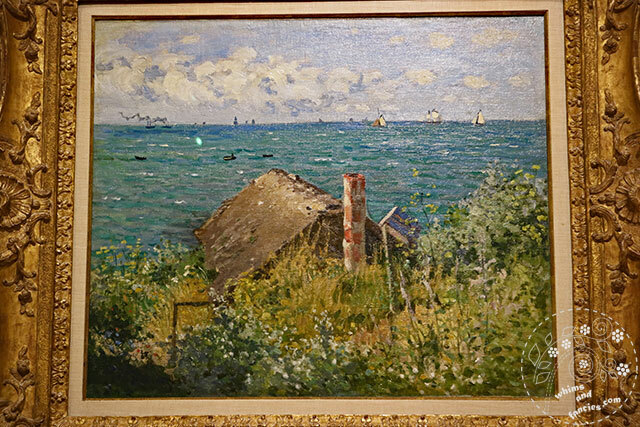 Wonderful to see some new to me Monet paintings. The flowers you picked out for your garden are lovely. Can’t wait to see the garden. 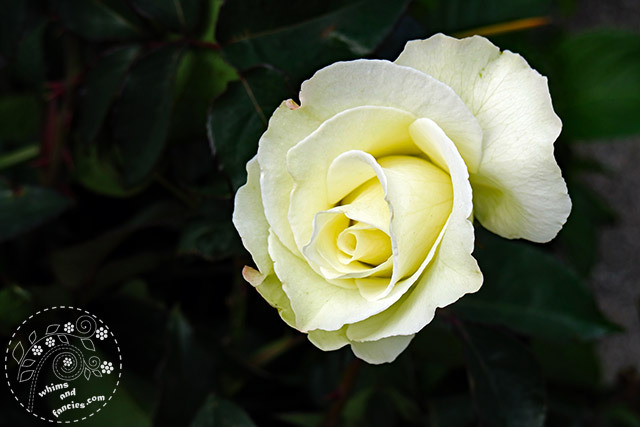 The white rose is absolutely gorgeous. Also love your violin pattern! love the violin pattern – wow! Such eye candy.!! This is a lovely collection of so many favorites… music, paper piecing, flowers, Claude Monet… What fun you must have had at the museum !!! What a wonderful trip Soma! I need to get up there to see this, plus the Matisse/Diebenkorn at SFMOMA. Beautiful flowers you picked out – they will make for a lovely garden! It looks like you are making very good use of your rain :) My sister is a great flower gardener…me, notsomuch but I enjoy seeing what I can get to grow. I have a small patch of heirloom poppies she gifted me from an old farmhouse property she used to live on and I jealously try to keep them blooming each year. I found a yellow version of butterfly weed at the nursery yesterday that I have high hopes for this year. Enjoy your break! !